There are a million takes on the Vietnamese banh mi. The classic features a baguette, pork, pate, and fresh, crispy veggies. Then there are the regional variations, the hipster fusion versions, the food truck takes. And then, there’s the banh mi sandwich at The DeLuxe in Reno’s West Street Market. The translation is simple – “wheat” – as is the composition of this cultural and culinary masterpiece. The sandwich as we know it today started sometime in 1954, when the French got the boot from Vietnam but left behind a taste for baguettes. Locals added pork and pickled vegetables, and when southern Vietnamese began emigrated to the US after the Vietnam War, they brought their local recipe along. Everyone has their version of this simple, perfect sandwich, but there is one non-negotiable. The bread should be on point – crispy on the outside, soft on the inside. 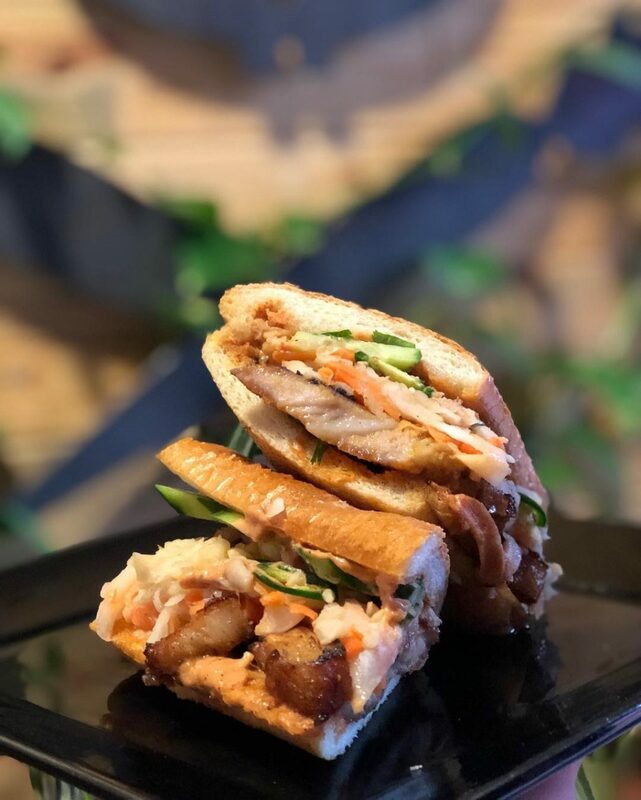 It’s so important, in fact, that at The Deluxe, a self-described sustainable craft Asian food purveyor and go-to for the vegan and gluten-free crowd, everything on the menu is gluten-free – except for the baguettes on which it serves its banh mi sandwiches. Spoiler – you can opt for gluten-free bread if you must. • The tofu banh mi – toasted baguette, tempura tofu, jalapeño, cucumber, pickled radish, curry mayo, and cilantro. Yum. • The chicken banh mi – toasted baguette, slow-simmered chicken, orange pepper cayenne, pickled carrot, cucumber, cilantro mayo, cilantro. Oh my. • The po’ boy banh mi – toasted baguette, tempura oyster mushroom, kale slaw, cucumber, pickled jalapeño, hottie mayo, and cilantro. Hold the phone. Plus, the crew at The DeLuxe likes to get creative now and then with special ingredients sourced locally. So, yeah, sometimes you can get a pork belly banh mi. And that’s a good day. Truthfully, you can’t go wrong with any of these. Vegan if that’s your jam, gluten-free if you wish, but hands down the best banh mi sandwiches in town. Come, eat, and judge for yourself.